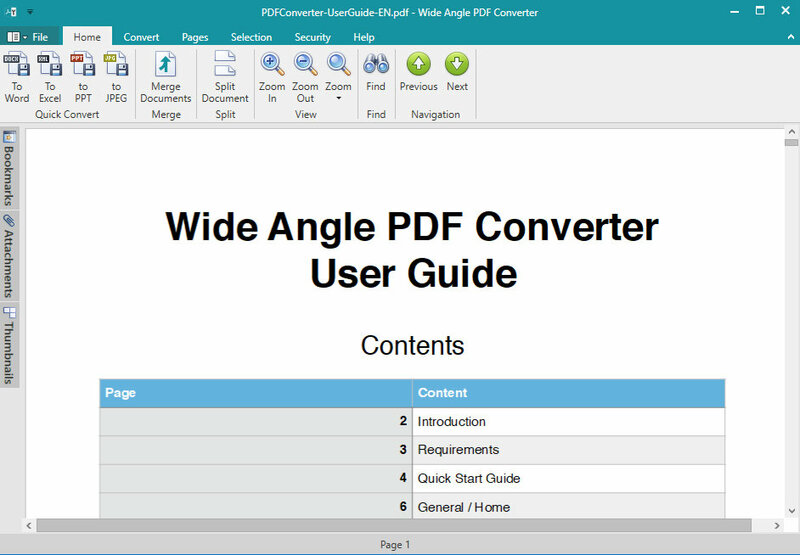 Welcome to the Wide Angle PDF Converter User Guide. This document will guide you through the steps to using PDF Converter. Easily convert your PDF documents to a huge range of formats for use in Word, Excel, Powerpoint and more! You can even edit your PDF documents, merge multiple PDF files, and set passwords and permissions to secure your files. Wide Angle PDF Converter is a professional program for Windows PCs. This User Guide will guide you through using PDF Converter and introduce and describe all of the cool features the program has. You can explore all of the functionality of the software with the free demo, but this version is restricted to the save or conversion of up to 2 document files. See the Wide Angle PDF Converter Terms and Conditions for more information. Operating System: Microsoft Vista, Windows 7, Windows 8/8.1 or Windows 10. PDF Converter is a 32-bit application which can be used on both 32-bit and 64-bit Windows systems. Microsoft .Net Framework 4. The PDF Converter installer will detect if you do not currently have this installed and offer to install it for you. Wide Angle PDF Converter is not currently available for Mac OSX systems.